For the sake of the article lets assume that Jack Zduriencik, general manager of the Seattle Mariners, is a smart man. 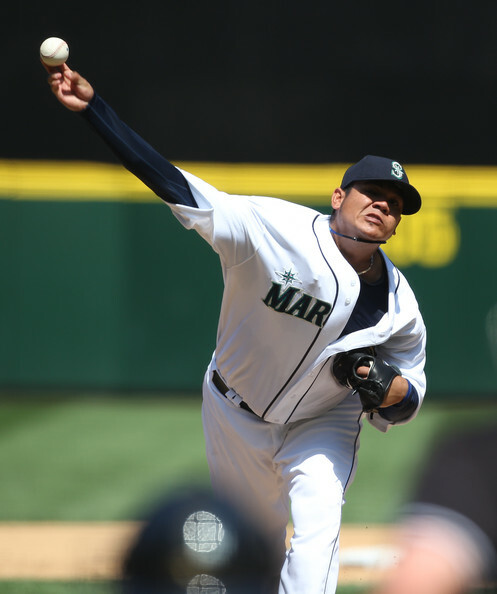 While I personally do not understand what he is doing with this franchise, lets all assume that the reported seven-year, $175 million dollar deal they have with Felix Hernandez was necessary for them as a team and that it will be good for them in the long run. What it also means, is that the Detroit Tigers, Tampa Bay Rays, San Francisco Giants, and Los Angeles Dodgers just might have to dig a little deeper than they were hoping (I’ll call it the Joe Maurer/Yadier Molina effect). The value placed on Felix Hernandez ($25 million dollars/year) is significant because you’re essentially saying that a 26-year old, Cy Young Award winning pitcher, whose 98 wins since 2005 have accounted for 17% of the total the Mariners have won over that same period is worth 31% of your (estimated) payroll going forward. For me, as an obvious outsider, it doesn’t add up. Especially when you consider deals of recent ilk (Zito, Johan Santana, Kevin Brown, etc.) don’t equate into championship baseball because of them. Now, you have a fresh group coming out starting in 2014 with Justin Verlander and Tim Lincecum, followed by Clayton Kershaw (2015) and David Price (2016). Verlander, the 2011 MVP and Cy Young Award winner, will almost certainly eclipse what Hernandez is making annually because he has also led the Detroit Tigers to two World Series in six years. What will that do to a Tiger payroll that has Prince Fielder, Victor Martinez, and the newly signed Torii Hunter on the books? My guess is they will trade Martinez, which may come back to haunt them because their run production was down from 2011 and their lineup (as evidenced in two trips to the World Series) isn’t built to withstand solid pitching. Lincecum is an interesting case because you have a two-time Cy Young winner and two-time World Series champion who will also be looking to cash in on his free agent stock. While his value took a dive this past season (10-15, 5.18 ERA) he was able to redeem himself during this season’s postseason run (2.55 ERA, 20 K’s, 17.2 IP). San Francisco, whose stable of pitching includes Matt Cain (who recently signed an extension himself), Bumgarner, and Voglesong will no doubt want to re-sign Lincecum, but if he’s paying attention to what his contemporary up north just received he may price himself out of San Francisco’s range. Of course it’s never too early to talk about the David Price sweepstakes in 2016. We all know the Rays history with player contracts, and I don’t see them being able to keep Price once his arbitration clock hits zero. Just 26-years old, I’m almost certain he remembers the Rays handling of his situation when he was first coming up in 2008. That being to squeeze extra time out of him (a practice more common than uncommon) and with no ties other than it being the franchise that drafted him I don’t see them being able to find the money to keep him in St. Petersburg beyond 2015. With Price looking to possibly receive a salary beyond the C.C. Sabathia range (Sabathia currently sits at $25 million per season) he’ll without question be relocating to a bigger market. Which is unfortunate, because the Rays have such a fantastic front-office and a farm system loaded with enough talent to form something special in that area. Kershaw very well could stay in Los Angeles, but with him being (in my opinion) the best of the entire group it certainly won’t come easy; even for the recently spending happy Dodgers. At just 24, he will be a free agent in 2015 (age 27 season) and could become the first pitcher to earn $28 million dollars or more per season. Left handers with his ability, at his age, and with that much upside are almost impossible to find. With that, he could be the one to also switch coasts as the Dodgers (barring they don’t clear salary space or decide they’re just going to outspend at whatever cost) could be looking at a scenario where the pitching face of their future might not be theirs. What plays in their favor is that Josh Beckett ($15.75 million) will be off their books, Andre Ethier or Carl Crawford may not be there (freeing up anywhere from $18-25 million) because of trade value, and a new television deal that is reported at $7 billion dollars might make it a little easier for them to keep Kershaw over the Red Sox, Yankees, or Cubs. What also works in their favor is the deal that Frank McCourt signed Matt Kemp to on his way out ($21.5 million per season looks like a steal the way the new group has come in and done things), which saves them an additional five to six million on a contract that could have been much more expensive. Bottom line: there will be movement with at least three of these pitchers because of this contract given to Hernandez. Can I fault the Mariners decision to give that contract to him? No. I understand their thinking based on the fan base wanting to lock up the premier pitcher/face in their organization. But what I will be able to fault them for (in the not-too-distant future) will be the movement of some of baseball’s finest young arms to places fans might not want to see. And yes, that even includes Felix Hernandez himself once he’s tired of all the losing.